My husband, despite coming from Chicago originally, likes Tex-Mex food a lot. He does not, however, like cheese and onion enchiladas. It is the cheese that he objects to, not the enchiladas themselves, so because I love him I make him beef enchiladas when I make cheese and onion for myself. 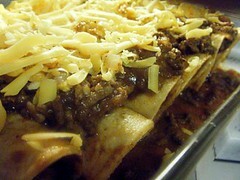 Beef enchiladas are simple, but I wondered what the internet would have to say about it. When I did some research I was shocked at how utterly strange some of the recipes were. One called for a packet of taco seasoning, sour cream and diced black olives, another wanted you to make the enchiladas in flour tortillas (ewwww, gummy! ), and yet another called for cream of chicken and cream of celery soups (Aunt Sandy, is that you??)! Quelle nightmare!! 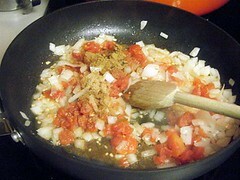 My recipe is simply seasoned ground beef, onions, and Rotel tomato. That is it! No taco seasoning packets, no olives and certainly no condensed soups. The method for making them up is identical to the cheese and onion variety, which is handy if you make both at the same time. Making the beef filling is ten minutes work, if that, and you may have some left over depending on how stuffed you like your enchiladas. It keeps well, and can be frozen for up to one month. It also makes a lovely filling, mixed with some refried beans, in a burrito. In a heavy bottom pan heat the vegetable oil over medium heat. 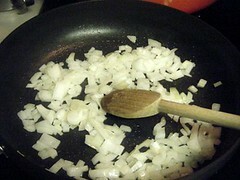 When it shimmers add the onion and cook until soft. Add the garlic and cook for thirty seconds. Add the Rotel, cumin, coriander, and paprika. 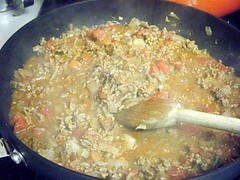 Cook until fragrant, about 30 seconds. 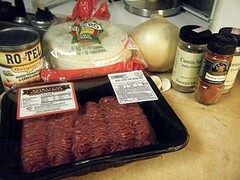 Add the ground beef and cook until well browned. Season with salt and pepper then add the chili con carne. Cook for five minutes. Heat oven to 400 F and prepare a pan with cooking spray. Heat the chili con carne in a heavy pot until it simmers. Reduce the heat to low and cover. Wrap the tortillas in a towel and microwave for 30 seconds, then flip them over and microwave for 20 seconds more. You want them warm, but not steamy hot. Pour 1/2 cup of the chili into the prepared dish. 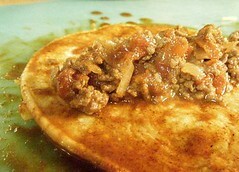 Dip each heated tortilla in the chili, then fill with the beef mixture. Roll the tortillas into a tube shape and place in the dish. Pour over the remaining chili and top with the cheese. 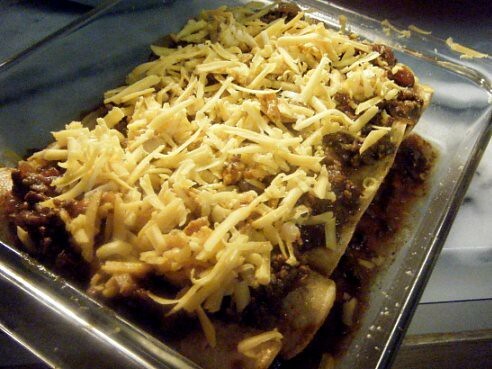 Bake for 20 minutes, or until the cheese is melted.